Canberra was conceived and planned as a city not like any other for the first 75 years of its conception from the Griffin plan of 1912 with planning guidelines specifically modelled to maintain it as the city in the landscape. Since self-government in 1988, planning has been governed increasingly by the global orthodox canon of increasing urban densification, urban consolidation and high-rise buildings without regard for the significance of the context and setting of the city. Two outcomes are low priority of heritage considerations leading to loss of heritage precincts and downplaying of the historic landscape ethos leading to loss of landscape space and trees and blocking views of the surrounding hills that are quintessential to the setting and ambience of the city. 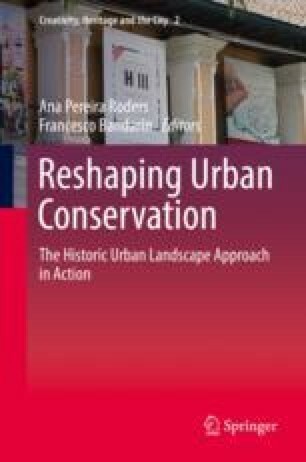 This chapter critically examines how planning action and governance for Canberra need to refocus on the essential elements of the Historic Urban Landscape (HUL) approach as rapid change and transformation of the city occur. UNESCO (2011). Recommendation on Historic Urban Landscape [HUL]. http://whc.unesco.org/en/activities/638. UNESCO (2016). THE HUL GUIDEBOOK managing heritage in dynamic and constantly changing urban environments, a practical guide to UNESCO’s recommendation on the historic urban landscape. Paris: UNESCO. http://www.hulballarat.org.au/resources/HUL%20Guidebook_2016_FINALWEB.pdf.